October is 'Buy Nothing New Month' and although I blew that challenge when I shopped the latest Shopbop sale, it did make me head to the opshop (thrift store) first when I felt like getting another kimono. Now it's spring I've started to wear mine again and thought another would be a good addition to my wardrobe. I managed to pick up this pretty navy one below in the first store I looked in, so it was meant to be! Suddenly summer temperatures arrived in Brisbane and it was a good reason to get my shorts collection out again! It's been a long time since I last wore these, as I was pregnant last spring/summer. Couldn't resist a little bit of print mixing with the striped tank, and although the print on this kimono doesn't have any pink in it I thought the neon bag was nice with the navy. 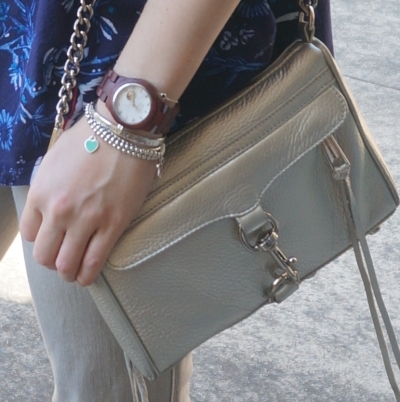 The style challenge for the day was "reward yourself" so wearing my new-to-me purchase seemed fitting. I'd managed to get a rare amount of time to search through a couple of local opshops which was rewarding enough, but really wanted to have a productive trip. The great thing about kimonos is that you can pretty much ignore the size on the label. I was glad when I found this one, even though it's not my size, as it just looks oversized like a regular kimono. Last worn: Ray-Ban Wayfarer, striped tank, denim shorts, rose quartz leather sandals, hot pink mini MAC. First time I've worn the kimono as it's a new purchase. Other ways to wear: striped tank and leopard print, denim shorts and strawberry shirt, rose quartz leather sandals and a maxi dress, hot pink mini MAC and winter layers. After a couple days of more spring-like weather I decided to wear my jeans again. I realised this was a mistake when we got to playgroup though - it was such a hot day, really wish I'd gone with shorts! I did like the colourful kimono and teething necklace against the black and grey. The outfit was just a little too warm to sit outside with the boys comfortably. I changed as soon as we got back home. The style challenge for the day was delicate - but I couldn't think of anything delicate to wear that would stand up to a morning at playgroup with an energetic bunch of toddlers and a drooly, grabby baby! Two years ago I decided to look more critically at things I was adding to my wardrobe. After I've worn something twice I do a purchase review. It helps me identify when I'm buying the right things or the wrong things and will hopefully stop me accumulating items in my wardrobe that sit there with tags on months later. It's worked well so far, with the odd exception. I know I didn't need another kimono. I already have two other blue ones, and a grey one with a similar floral and bird print. However I know from last spring/summer and our heatwave plagued autumn that kimonos are one of the pieces I wear consistently in the warmer weather, so I'm confident this will get used a lot. It was just $7 so I'm certain to get my money's worth. It's sure to be worn a lot. Last worn: navy kimono (above), black tee, grey jeans, Havaianas, Rebecca Minkoff silver mini MAC. Other ways to wear: navy kimono (above), black tee and a maxi skirt, grey jeans and a trench coat, Rebecca Minkoff silver mini MAC and ombre dress. Linking up with Turning Heads, Trend Spin, Style Sessions, Wardrobe Wednesday, Midweek Inspo, Fresh Fashion, Oh Hey Girl. I LOVE THAT KIMONO!! Such pretty colors and it looks great paired with the bright accessories. :) For $7 it was totally worth it!! It was such a bargain! Yay for thrifty finds! It's always the best feeling when you walk into a thrift store with something you want in mind and end up leaving with it! (: This looks great on you! I love the transition between the two looks with the casual, and more work ready, second photo. Last summer, I wore a lot of my kimonos to work. To my surprise, they are super easy to dress up! This is a really pretty piece! I don't see that many kimonos here in the thrift shops, but I love the look. They do seem hard to find in opshops! Jealous of you entering the summer months! Love your looks. Oh I'm jealous of your shorts! I love fall clothes but I know I'm going to miss shorts so very soon! I think the kimono is perfect and well worth the investment. Especially if there are certain types of clothes you just know you'll wear a lot, it's definitely going to be worth the purchase. Especially for 7 whole dollars! Very pretty always. I absolutely love the bags! Have a wonderful week! Buy nothing month - I like the sound of that and should try it. That kimono top sure was meant to be. Looks beautiful on you. I am seriously impressed by your kimono collection - you always seem to manage to find them in the most amazing prints! Love the way you styled them in both outfits! I am starting to get a little collection, haha! I absolutely adore the way the neon pink bag looks against the navy, I think that was a great call to add it to the look! The kimono is so pretty and definitely one that can be versatile and plus it's blue, which looks SO good on you! Thanks for sharing, beauty, and I hope you have a great week ahead! Really love that kimono! And I love the two ways you styled it. You're so lucky to be experiencing warmer weather. The weather isn't to bad where I live yet but It's only going to get colder and we are suppose to get A LOT of snow this winter apparently. Not looking forward to that. Hopefully it doesn't get too cold for you! It's spring here in Australia. I really need to spend some time going through the thrift stores because I've read about so many great finds like you with this kimono. My problem is I rarely have the patience to go through racks of clothing. Yes it does require time and patience! You are the kimono queen! I love this one and with as much as you wear your others no doubt it will prove to be a good purchase. Both looks are fun but I especially like the print mix in the first look. Loving how you were able to transition the kimono for weekend wear with the shorts and for a more dressy look with the beige pants! So versatile! Well at $7 it sure is a steal and something not to feel too guilty about. Especially since this is something you already know you're going to get much wear from. The temps were on the warmer side down here too, thankfully it hasn't lasted too long and we're back to 14 degree weather! Boom! Such a cute kimono! Aren't they perfect for warm weather? They add such a nice cool layer. Love the kimono and both ways you styled it. The stripes are a great way to print mix, especially with that fun pink bag! I love the navy kimono both ways- kimonos are a fave of mine right now! I love kimonos, I was obsessed with kimonos 2 years ago and I purchased a ridiculous amount! I love how versatile they are and you can wear them with everything!!! Yes shorts are a must-have in summer! I did get really lucky! The kimono is so pretty and love how you styled it both ways. An excellent and thrifty purchase. Jealous of your warm weather. Still very much jeans appropes here today. Shorts are my favorite thing to style a kimono with. It especially works well when they are a bit too short at the back and provides extra coverage. The first look of yours is definitely my favorite. Hope you had a great weekend! That pink bag is so eye catching. I could never pull it off myself, but you make it work! I have to make a note, like real paper and pen to get my kimonos out of the closet. I see you wear them and wear them SO well... they dress any outfit ! Welcome by tonight or tomorrow night and linkup with my Thursday Moda linkup. Thanks. I love thrifted finds! This is a great one! You totally will get use out of it! Love the kimono, great find. I think it is smart to evaluate what you buy and what is needed in the closet. 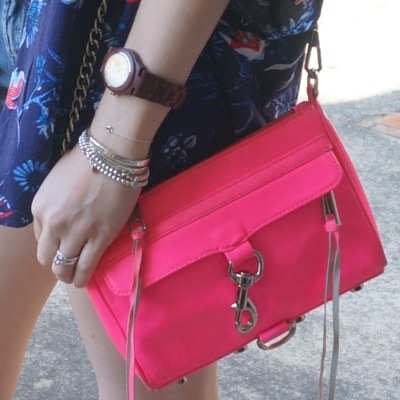 Love the bright bag against your outfit. Perfect for playdate!